Had I read Farewell to Prague by Miriam Darvas even two weeks ago, it might not have resonated with me as much as it did. Even though WWII ended 70 years ago, the plight of refugees is just as relevant today. 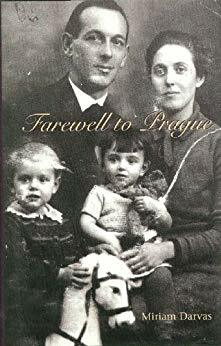 Farewell to Prague is a memoir set against the turbulent events of the Nazi era in Germany and World War II England. It is the story of a girl, Miriam Darvas, who, at the age of six, witnesses a murder being committed by German Storm Troopers. From that moment, the happy life she has known disintegrates. This book was very hard to put down. It was not terribly detailed in some parts, but that mostly worked in the book’s favor. The urgency that pushed Miriam to move from place to place on a daily basis during some passages is conveyed to the reader. What I found really interesting was how everyone worked together against insurmountable odds to help Miriam survive. She didn’t know where she was going or how she would get there, but she made it. Every stop along the way there were people willing to help her, feed her, give her a place to stay, and protect her. It is amazing to me how this “underground railroad” so efficiently moved children out of continental Europe. It is also a testament to the human spirit and how everyone works together in times of desperation. At any time, Miriam could have been raped or murdered and no one would have ever known what happened to her. But she wasn’t. Everyone was under threat and everyone worked together. Again, it was amazing and terrifying to read. The book was also interesting from a psychological point of view. The short-term and long-term impact of war (displacement, fear, loss, death) on a child are explored thoroughly. I think this is why the book resonated with me so much in this era. Right now, Europe is experiencing an influx of refugees not seen since WWII, but their experience is frighteningly similar. If you want to know what those refugees are experiencing now, read this book. It is terrible that we are seeing these same scenes play out over and over again. Have you read Farewell to Prague? What did you think?